You are here: Home / Not working? 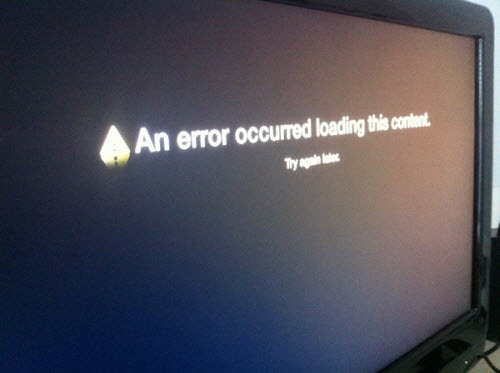 / Apple TV: An Error Occurred Loading This Content. Try Again Later. This issue may usually occur because of a poor network connectivity issue that is preventing your Apple TV from reaching the video providers servers. This will start your test. If you are unable to restart your device this way, unplug your Apple TV from its power source, then wait around one minute and plug it back in. 3. If you are still having this problem, simply update software (tvOS) on your Apple TV. It is a very simple process. Simply go to Settings > System > Software Updates and Select Update Software. The process may take a few minutes. Your device will restart. 4. Restart your modem and Wi-Fi router. Simply unplug them from power source and wait about 10 seconds and plug them back in. 5. Ensure that your Wi-Fi router has the latest version of its software. Consult manufacturers’ manuals for more information. 7. Disconnect the HDMI cables (TV and Apple TV) and unplug the power cables, now plug in the HDMI cables while the power cables are disconnected. Then plug in the power cables, first TV and then Apple TV.